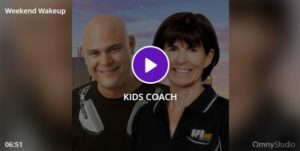 The Kids Coach provides children aged 4-10 years old with kids workout and exercise videos. Helping kids get active and stay fit in a fun and exciting way. Jamie Jones and Roisin Sullivan the co-founders of The Kids Coach and joined Darren and Sue on Weekend Wakeup.